The new C6930 control cabinet PC from Beckhoff combines everything a cutting-edge Industrial PC requires in a compact aluminum housing: a 3½-inch Beckhoff Motherboard designed for Intel Core Duo or Core 2 Duo, a wide range of PC interfaces, up to three Ethernet ports, e.g. for EtherCAT-based controllers and optional fieldbus interfaces for conventional bus systems. The C6930 offers high data security through an integrated RAID system for mirroring hard disks. The C69xx control cabinet PC series currently includes four devices with compact designs, ranging from the C6915 mini PC with Intel Atom CPU to the new compact C6930 IPC with impressively small dimensions of only 89 x 231 x 119 mm (W x H x D). The compact Industrial PC is designed for control cabinet installation and features a 3½-inch Beckhoff Motherboard for Intel Core Duo or Core 2 Duo. Cooling fins behind the right-hand side panel enable fanless operation of the PC at temperatures up to 55 °C. The C6930 control cabinet PC has an on-board SATA RAID controller for mirroring two hard disks. It can be used for convenient configuration of RAID applications supported by TwinCAT automation software. In addition to or instead of the hard drive, a flash disk can be integrated in the form of a Compact Flash card (CF) or a solid-state disk (SSD). The result is high data security that can be enhanced further through optional UPS functionality. The C6930 control cabinet PC features two free plug connector panels for additional interfaces installed ex works such as RS232, sound and two additional USB ports. Optional fieldbus interfaces, e.g. for PROFIBUS, CANopen, DeviceNet or SERCOS; a third Ethernet port or a NOVRAM memory module for fail-safe storage of process data can be connected via a free Mini PCI slot. The compact C6930 control cabinet PC is ideally suited for application as a central controller in an EtherCAT-based control system. It is equipped with two standard and an optional Ethernet port and offers optimum performance for all EtherCAT control tasks. 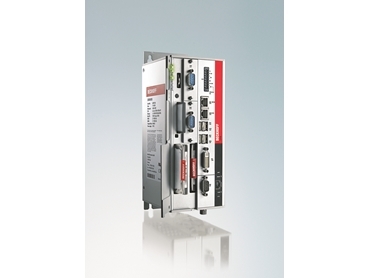 The new C6930 control cabinet PC is available from BECKHOFF Automation .